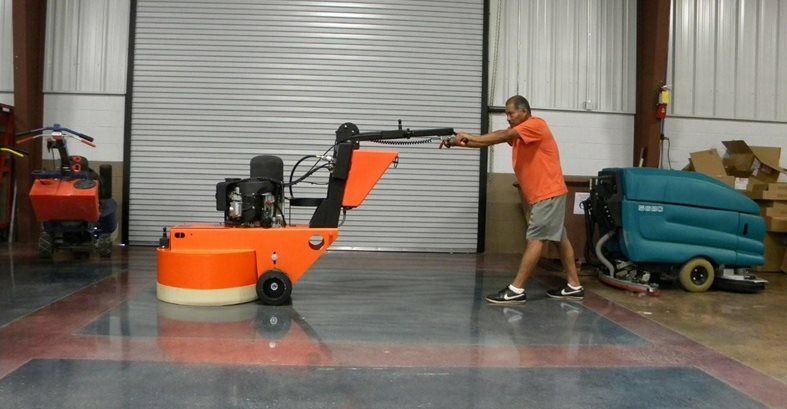 Before you invest big money in a concrete floor grinder, be sure to listen, learn and ask the right questions By Bob Harris, The Decorative Concrete Institute, Temple, Ga. When you factor in the expense of a concrete grinder and all of the accessory items, you’re looking at a major investment. Do your homework and ask plenty of questions. Ask what kind of production rates can be expected with the equipment you are proposing to buy. Bigger floor grinders with more heads will cover large areas faster. Take the grinder for a test drive. You want to avoid a machine that leaves behind visible lines or striping. The biggest advantage of a propane-powered grinder is that it’s cordless, so you don’t have to rely on an electric power source or tether yourself to extension cords. For the greatest versatility, choose grinding equipment that is universal, allowing you to interchange diamond tooling from other manufacturers. My, how the polishing industry has evolved since its inception back in the mid-1990s. Back then when you visited the World of Concrete, you’d find less than a handful of grinding equipment manufacturers and diamond tooling producers interspersed throughout the exhibit halls. Fast forwarding to the current market and specifically this year’s WOC, the amount of choices available is overwhelming, to say the least. I felt sorry for the new generation of aspiring concrete polishers looking to get into the business, thinking that they were going to find all of the answers under one roof at the world’s largest concrete expo. At one point, I stumbled upon one of my former students visiting the show, and he pulled me to the side and said, “Help! I’m so confused on what I should be looking for when considering purchasing new equipment. All of the manufacturers are telling me their equipment has the latest and greatest bells and whistles.” Here was my advice to him, and it holds true for anyone overwhelmed by trying to make sense of which equipment best fits their company’s needs. Reflecting back on our conversation, the scenario reminded me of an episode from the old TV series Kung Fu. Master Po: [after easily defeating the boy in combat] Ha! Ha! Never assume because a man has no eyes he cannot see. Close your eyes. What do you hear? Master Po: Ha! Ha! Never assume because one grinder manufacturer claims to have the best and fanciest equipment on the market that they do. Close your eyes. What do you hear? Young Caine: I hear the same darn story at every booth I visit that their equipment is the best!! Young Caine: Who wouldn’t hear their own heart beat after what that damn salesman quoted me on the price of their equipment! Master Po: Do you feel the scratch pattern left behind from the previous grit at your feet, which is a result of advancing the machine at too fast of a pace. Young Caine: [looking down and seeing the scratches] Old man, how is it that you feel these things? Know Your MarketAs in the Kung Fu example, the decision on the appropriate type of equipment for your needs starts with listening and learning. You must truly have an in-depth understanding of what your target market is going to be and the project size your company intends on pursuing. Purchasing equipment can be a huge capital investment, and the differences between some of the equipment can equate to tens of thousands of dollars. This is why it is imperative to understand who your clients will be and if you will be servicing the residential, light industrial or heavy commercial market. When making such an investment, take into consideration that single-head machines can range in grinding widths from 20 to almost 40 inches. Obviously, the smaller machines are great for getting into tight and hard-to-access areas and fit through most conventional doorways. But they aren’t as efficient as larger machines in open areas. Conversely, larger equipment can almost double production rates on large projects, but they require higher voltage and three-phase power to operate. The reality of this market is that it is tough to compete with the big guys already established in the polishing world, especially when you are trying to get into this business. Learn the TerminologyDo you know the difference between a “planetary” and “nonplanetary” grinder? To differentiate between the many choices of equipment out there, you’ll need to learn some basic industry terms. Let’s start with “active planetary” and “passive planetary.” Active planetary is where there are two belts, one driving the drum and one separate from the drum driving the grinding heads. Passive is where the drum is driven with a single belt, which means the drum is rotating but the grinding heads are just spinning freely and not being driven with a secondary belt. A true nonplanetary grinder is where the drum is not spinning but the heads are gear-driven. The grinding heads overlap each other. 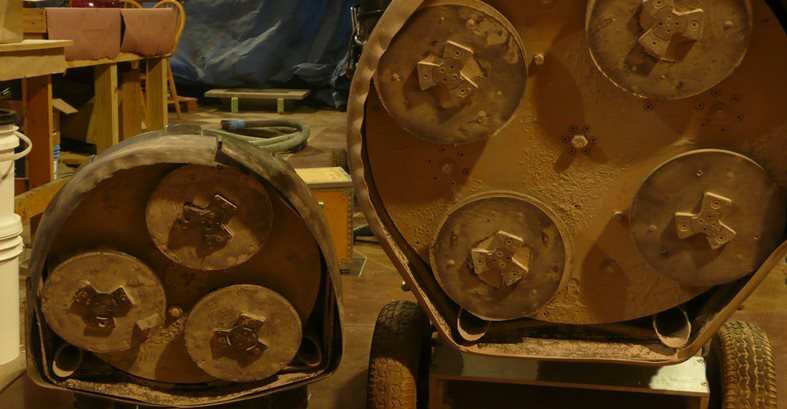 Some think that this type of grinding machines is better-suited for heavy bulk removal. If you are not careful with this type of machine, though, it is very easy to get visible lines or striping, which makes it necessary to swing the machine side to side to avoid a corn row effect. Evaluate Your Power OptionsAlthough I do not personally have a tremendous amount of experience with propane-driven machines, the biggest selling feature with this type of equipment is that they are cordless, which saves in production time because you don’t have to fight with electrical cords throughout the duration of the project. Of course, theoretically this means you would have to have a propane dust extractor too (assuming you are grinding dry), since you would be defeating the purpose if your vacuum was electrically powered. The downside, I’m told, is that propane machines do not have quite the torque or power a 480-volt three-phase machine has. Also, there are certain scenarios where the fumes from a propane-driven machine are not acceptable. Beware of Package DealsOn the subject of the diamond tooling, most manufacturers are going to try and sell you on their entire package or complete “system,” as they put it. 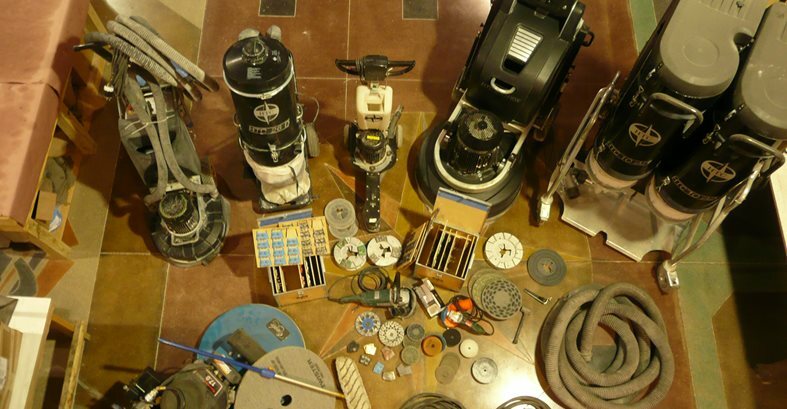 Does this mean most professional polishing contractors use one complete system throughout the entire process? The reality is, more often they do not. As I’m writing this article, I just finished consulting on two separate 50,000-square-foot projects with different contractors. Each of the contractors was using a certain brand of grinding equipment with dust-extraction equipment and diamond tooling produced by a competitor. The point being, it’s not always a “one size fits all,” and the true professionals of the business find which setups work best for them. Hear the GrasshopperThe best advice I can give to anyone considering diving into the polished concrete business is to do your research on the manufacturers and ask plenty of questions. After all, would you buy a new car without asking any questions? The last thing you need is to make a large investment, only to find out that your equipment is not performing like it should or you do not have the market to support your investment. I know of two scenarios in which contractors tried to save a few dollars upfront and purchased equipment that performed marginally, at best. A year later, they put their machines up for sale to purchase grinders that ran more efficiently and, quite frankly, polished a heck of a lot better. In another case, a contractor forked out close to $20,000 on a machine, but had it for five months before getting his first polishing job. 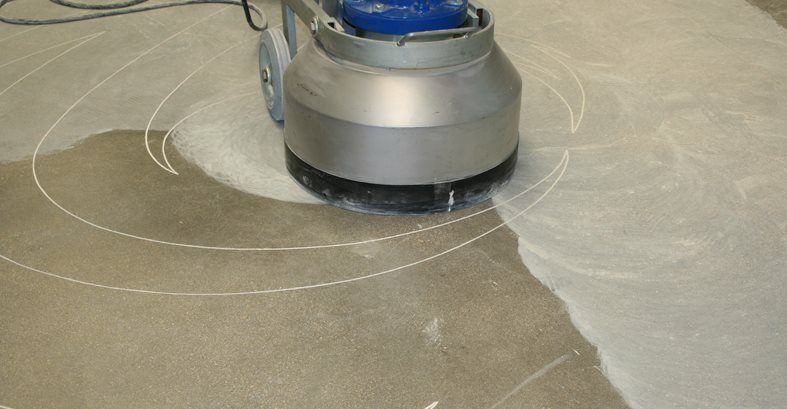 Fortunately for him, he was able to use his equipment on a weekly basis for prepping floors for cement-based toppings. How long have they been producing equipment? What makes their equipment different than their competitors’ machines? Does the investment come with factory training? Does the investment come with jobsite training? During the training, do you actually get to operate the equipment? Are maintenance and service-related issues, like changing belts, covered? What kind of technical support does the company offer? What are the company’s hours of operation and time zone (East Coast vs. West Coast)? Will you be assigned a salesman covering your territory so you’re not just dealing with a customer service rep? Do they have facilities at different geographic locations, in case you encounter a problem on the jobsite? What kind of production rates can be expected with the equipment you are proposing to buy? What are the power requirements (if powered electrically)? Do they have diamonds for soft, medium soft, medium, medium hard, hard and ultra-hard concrete, and do they have specific diamonds for polishing cement-based toppings? What is the life expectancy of the diamonds on the various hardnesses of concrete? Is their equipment set up to be universal, so you can interchange diamond tooling from other manufacturers? What is the square-foot cost of a set of diamonds? If down the road you want to upgrade, is there a trade-in program or will they help you sell smaller or older equipment? Assuming you purchase their equipment and go through the proper training, do they have a referral program?